I sure do love this illustration up above. 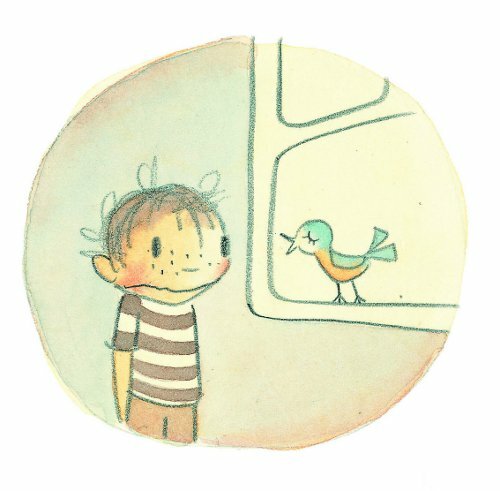 It’s the first Sunday of the month when I like to invite a student or brand-new illustrator over for morning coffee, and today 7-Imp welcomes debut author/illustrator Abby Hanlon. Abby is, as she tells you below, a former first-grade teacher. I’d tell you more about Abby’s artistic style, but you can see plenty of it here today, including some illustrations from the book. I thank her for visiting. 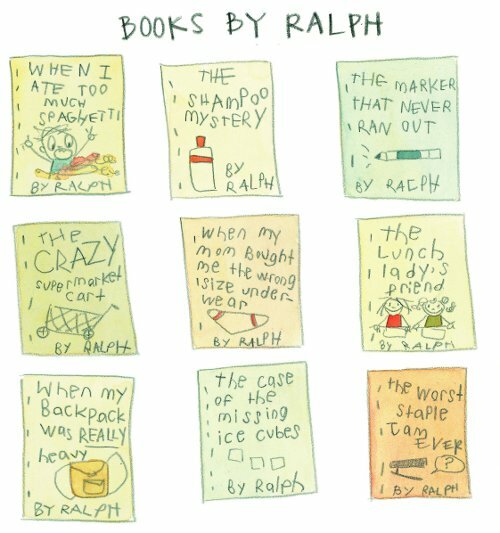 Be sure to check out the book’s endpapers below (my second favorite part of the book), which are the end results of Ralph’s inspiration. 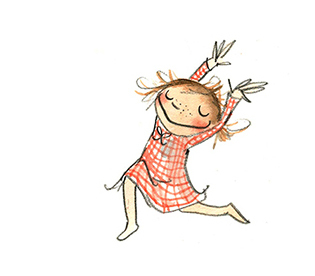 Abby: I am thrilled to be here today at 7-Imp. 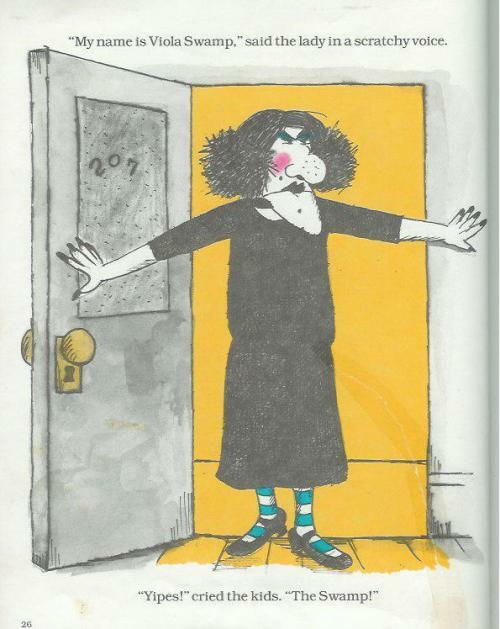 Thank you so much to Julie, whose blog has been a critical connection for me to the inside world of children’s book illustrators. Only a few years ago, I embarked on the long journey of teaching myself to think visually. 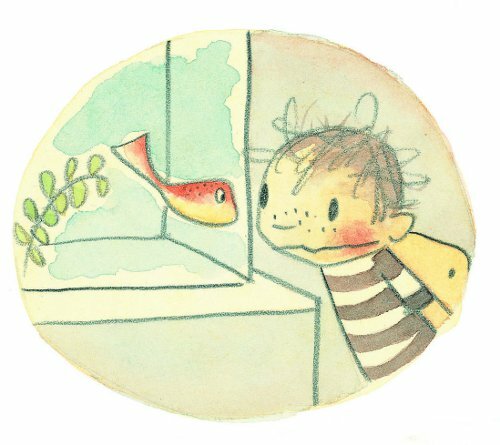 And until recently, I didn’t know a single other person who worked as an illustrator, so reading this blog has been an essential part of my learning process as I burn the midnight oil. I used to be a first grade teacher, which is when I fell in love with children’s books. I loved reading aloud to my class, and I would get completely absorbed in a story — turning off all the lights and huddling together for the ghost story in Ira Sleeps Over, getting carried away by playing the role of Miss Viola Swamp with my ruler, or reading the cat’s lines in a berserk voice in the Cat In the Hat (and then being mortified when the principal walked in to observe. Do I keep doing the voice for … oh my god … 40 more pages?). I always felt like I didn’t know a book until I read it to a class. Often, I would look though a book quickly, and think, this book is nothing special. But then I would read it to a class of six-year-olds, and it was like this whole secret world would open up to me. Their reactions to stories are powerful, and the discussions we would have after a good story allowed me to understand kids in a new way. It wasn’t until I was a mom and home with my kids that I got to actually look at books. As a teacher, I was holding up books for the class and never had the time to sit down and read the pictures, as children do. Going to the library for me is serious business; I come out with a stack of 30 books, and then I go home and fight with my kids about which ones we are reading first. When people ask me what my kids want for their birthday, I say children’s books that I secretly want. Nobody suspects. 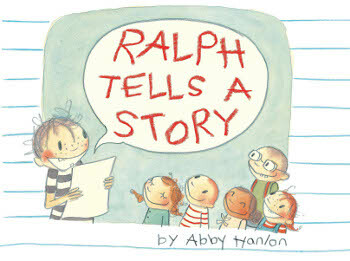 My first book, Ralph Tells A Story (Amazon Children’s Publishing, which acquired my original publisher, Marshall Cavendish), came out in September. The book is about a little boy in his classroom who is struggling to write a story. 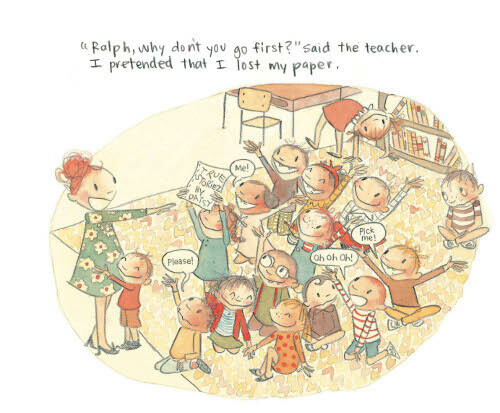 I set out to create the book that I wished I had as a teacher – a book that would help my students find stories in the little events that make up their day. Humor is a great way to inspire kids, so I wanted to make a funny book that children could see themselves in. I wanted to portray the pressure of a classroom, the insecurity of a young writer, and the temptation to distract oneself from a difficult task. I also tried to convey the joy of a classroom and the power of a class coming together. The book has been getting an incredible response from elementary school teachers who, just like me, feel that they need this book. 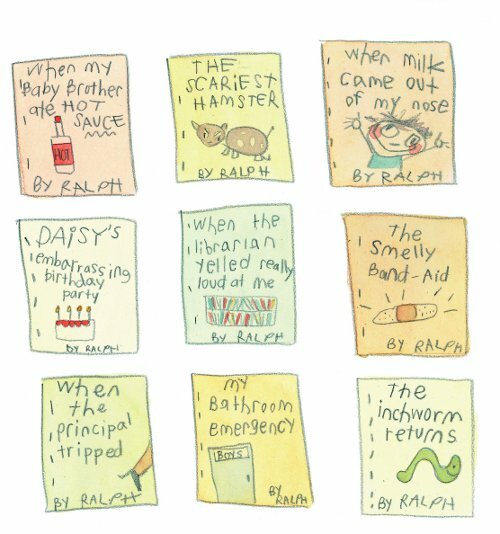 I thought of the story idea for Ralph Tells A Story before I could actually draw, so illustrating this book was a ridiculously tortuous, yet ultimately life-changing, experience. Writing and illustrating for kids is all I want to do, and I don’t know why it took me so long to figure that out. RALPH TELLS A STORY. Copyright © 2012 by Abby Hanlon. Published by Amazon Children’s Publishing. Images reproduced by permission of Abby Hanlon. 1) I’m grateful that my East Coast-friends, my family, and my co-author are all okay, in the wake of Hurricane Sandy. 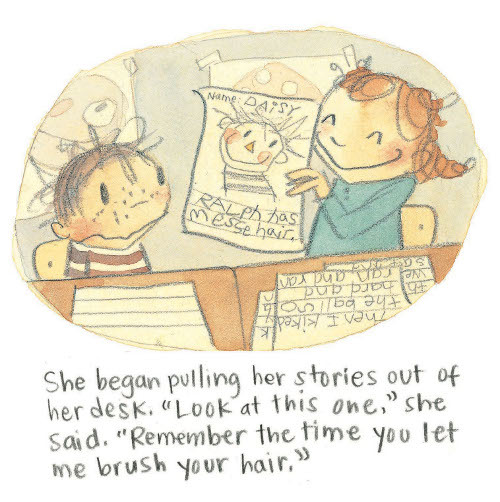 2) That’s super nice what Abby had to say about 7-Imp. It always makes me happy to hear that people can use the blog as a resource of some sort. 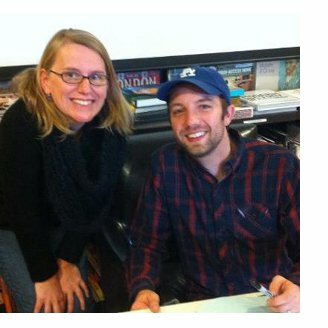 3) I got to meet author/illustrator Jon Klassen this week in Nashville (pictured left). 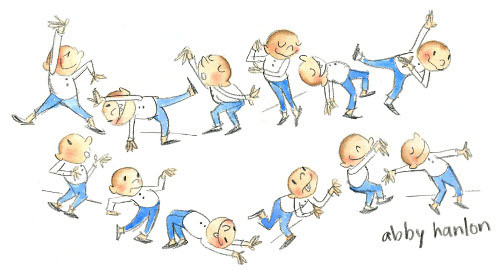 4) Speaking of Klassen, the New York Times announced their Best Illustrated Children’s Books of 2012. I always look forward to this announcement every Fall. A handful of these books were featured here at 7-Imp this year. 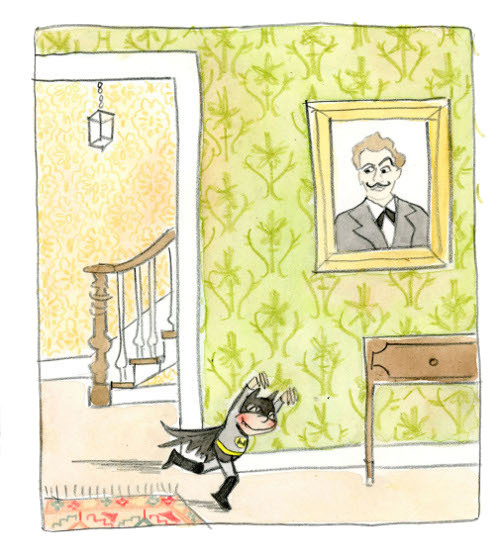 Travis Jonker has a wonderful, art-filled recap here at 100 Scope Notes. 5) I’ve got a new piece of Mad Tea Party art! 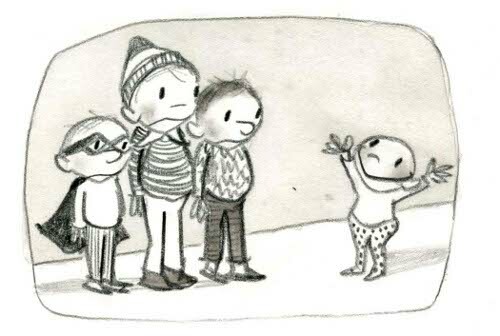 This one was created by author/illustrator Steve Light, who will be visiting 7-Imp soon. I thank him so much for the contribution, which I’ll place permanently at the site later. 6) I love this essay from author Adam Gidwitz, “In Defense of Real Fairy Tales.” Where do I even begin? So much wisdom there. 7) I mentioned last Sunday that we were heading out that night to see Noah Gundersen. He (and his sister who sang with him) were so good. You all, it was like an hour of holiness is what it was. I kinda felt sorry for the musician who followed him. It’s tough to sing after Noah, I’m sure. I’ve shared, I think, two Noah videos previously at 7-Imp, so I won’t be pushy and put another one here, but let me just say that he opened with this arrangement—“Poor Man’s Son” with “Down to the River to Pray”—which was OHMYGOD beautiful. Speaking of musicians, I really like the music of Ben Sollee, and I like this performance even more. He ends it, as you can see below, with “PLEASE VOTE.” You are gonna go vote, right? Tomorrow—tomorrow, I say!—our final manuscript revisions are due. So, it’s back to work for me, as Betsy and I continue to wrap stuff up. What are YOUR kicks this week? 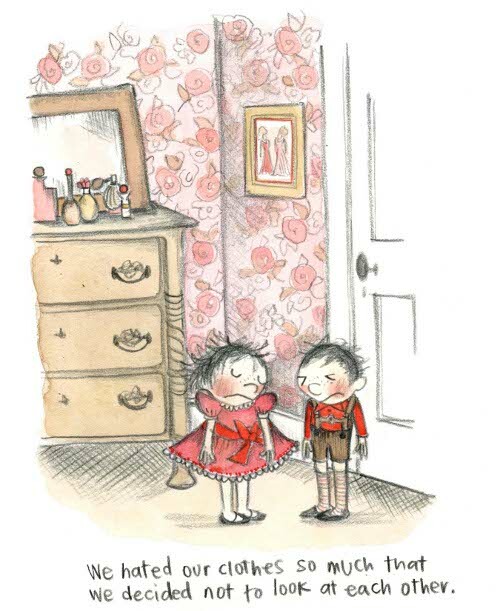 The illustrations and story today are lovely, Jules. I am impressed you are bringing us these things when your manuscript is due so soon! But thank-you! Love the new artwork for the site. And the essay you linked to. I hope all regular kickers here are ok after Hurricane Sandy. 1. This week our pet chickens were attacked by some neighbourhood dogs that regularly escape their yard. The dogs came under our fence, but fortunately my husband heard them and saved the chooks in time. A relief. 3. Croquet with work friends. I have never played before but it was great fun. Cannot see how those Victorian women did it in voluminous skirts though. 4. Tried out a new recipe – marmalade scrolls. I love making recipes that I have had my eye on for a while! 5. I have been wanting to do more snorkelling and will have an opportunity to do so next weekend. I went to buy a mask and snorkel and hit the first day of a clearance sale and got both for about 60%! 7. And on the topic of chores well done, I got my tax return in the day before it was due. Phew. I really like how Abby captures emotion and her use of simple color and pencil. Very nice. Jules: Did you steal Jon Klassen’s hat? Emmaco: Glad the chickens are OK. Our friends lost one to a neighborhood fox a few years ago. Hard to believe 1) there is a fox in a metro area…2) We have neighbors with chickens up the street! 1) Just bought a new sketchbook. For some reason this ALWAYS makes me feel good. Like the first day of school with all new school supplies. 2) Dan Santat’s book KEL GILLIGAN’S DAREDEVIL STUNT SHOW arrived (I ordered it from him as a package deal and it came with an original sketch, shirt of Kel, stickers, poster AND the book. It’s so funny and my family and I laughed out loud reading it. Actually, that should be kick #1. 6) Getting the piano tuned…actually it gets done on Wednesday, but I DID make the appointment. Love the artwork highlighted here today. Abby Hanlon has a light, free-flowing style all her own but very expressive. I’ll need to take a look at that book. Jules: Lucky you for meeting Jon Klassen. His art is amazing; House Held Up By Trees. Good luck on the final days of revisions. I love, love your new art. Emmaco: Glad the chickens are okay. It’s been years since I’ve played croquet but it’s so much fun. Lori: I got the Dan Santat package too! His illustrations are hilarious. I’ve got Kel in my Mock Caldecott list . 1. Halloween handing out books instead of candy. So many former students stopped by. Abby Hanson has written the perfect book about writing. I can so see some of my first graders. Jules, I will go read the essay on fairy tales. They were my favorite as a child. Emmaco, safe chickens and croquet, great kicks. Lori, nothing better than a new sketchbook. Margie, snow, I can’t wait. Our weather still continues to be balmy and wet. 1. That my cousins are safe. Several live in Belmar, NJ. 2. Trick or treating with oldest grandgirl. 3. Exchanging poetry books with Irene Latham. 4. A revision workshop with Suzanne Morgan Wiliams. 5. Christmas shopping for books by local authors at an event called Flip Flap. 6. Writing 30 days of thanks. 7. Participating in a poem a day (PAD). Abby: “When people ask me what my kids want for their birthday, I say children’s books that I secretly want. Nobody suspects.” LOOOOOOL. Lori: Whoa, sounds like an awesome package. Margie: I want to go trick or treating at your house. My students bought me pearls (matching ring, earrings, and necklace) and I am just so touched – especially since, and they don’t know this but, I think of THEM as my pearls. I am really excited about this post of yours about Abby Hanlon! 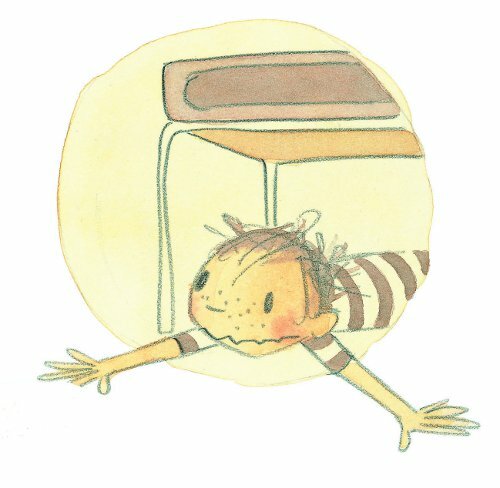 I first scanned through the illustrations and love them. Each illustration tells a story I want to hear more of. I love her statement that she doesn’t feel like she knows a book until she has read it aloud to her class. I too feel like that is the best way to judge the quality of a picture book — how well it tells a story to and captivates kids. Hanlon’s illustrations look like they would. I look forward to getting ahold of her book. 1. I dove into the Cybil reading this week and was pleasantly surprised by the quality of the nonfiction books read thus far. 2. The kids have been setting up libraries in our house and playing library for two weeks now. Very fun. 3. Nice family vacation this past week. 4. Watching the two oldest kids (ages 7 & 5) have fun on Halloween! 5. Friends in Brooklyn are safe. I’d best stop there b/c my kids need me to check out some more books! 1. We are in a very hard hit area of Sandy’s wrath. That said, we are mostly suffering from loss of power. Not life or shelter. For that, I am incredibly thankful. 2. In-laws with electricity, heat and water. 3. Girls who are still getting along with each other despite being on day 6 of camping out at Grandma and Grandpa’s. 4. Being able to get gas in CT during a visit to family. 5. Lots of time to read. 6. Lots of time to write. 7. This link to the Adam Gidwitz article. Just getting ready to write a blog post about him! What a fun book! 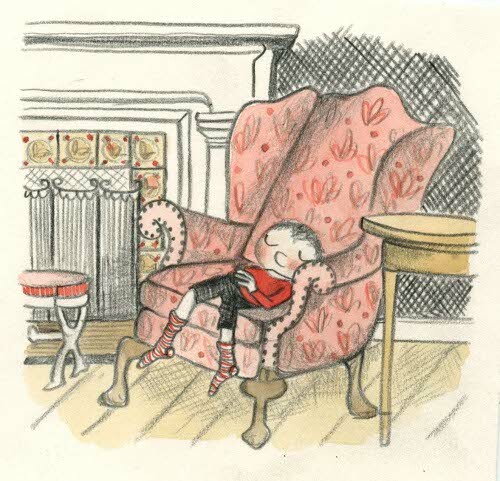 I love that Ralph’s friend Daisy writes stories about him, and the pictures of procrastination – so very true. Jules – love the new art, will check out the essay and music later today. Emmaco – glad the chickens are safe! Have fun snorkeling! Lori – Honey Crisp apples are the best! Yum! Margie – snow, a fire and a sleeping Xena – sounds so cozy. Jone – trick or treating with the grandgirl sounds fun, and 30 days of thanks sounds uplifting. Tarie – Hi! What a great gift from your students! Amy – Family vacation and kids playing library sounds like a great way to spend time. 1) All my friends in NY and elsewhere on the east coast are safe. 2) Saw The Descendants Friday night – loved it. 3) Sushi for dinner Friday. 4) A good night’s sleep. 6) Bookshelves of doom did a post about songs about murder that was great, with a link to another site that is all about noir songs. 7.5) Chasing Ray’s post on “Why I Vote” Lovely and moving. 9) Tuesday the 6th – excited & nervous for the election, so planning to watch with friends. I hope everyone and their loved ones on the east coast are safe too. Hope everyone has a great and democracy filled week! Hi Imps! I hope that you all had a safe and happy Halloween, but more importantly, I hope you and yours are all truly safe and sound. American Imps, please vote on Tuesday. Please! Hello, Abby! Thanks for sharing your art with us. I like all the happy expressions you’ve captured. Hurrah for huge stacks of library books! Congrats on your career. Jules: Cool that you met Jon. Reading Adam’s essay after I post this. Thanks for the music. Good luck with your final revisions! 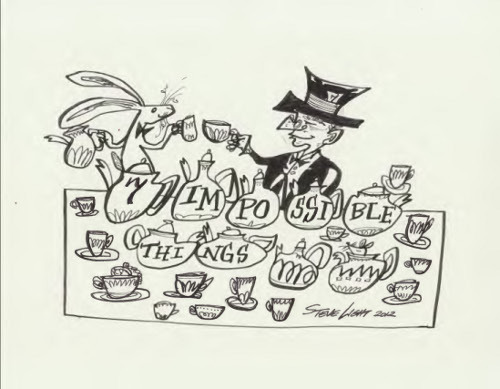 Steve Light: Very cool tea party illustration! Me gusta. emmaco: I’m so glad that your chickens are okay. Poor things. Have fun and be safe snorkeling! Lori: Yay for the piano getting tuned, and YAY for the new sketchbook! Margie: High-five for handing out books instead of candy. That’s awesome. Hi, Xena! Jone: Glad to have a month of poetry and gratitude, I bet. Amy: Enjoy the reading! How nice to have vacation. Stacey: Sending your household and your neighborhood lots of good thoughts. Rachel: Yay for Colleen/Chasing Ray and the Why I Vote roundup! 2) Today’s musical film audition – I am getting ready as I post this! 4 and 5) Auditions I had on Friday – I had an absolute blast! 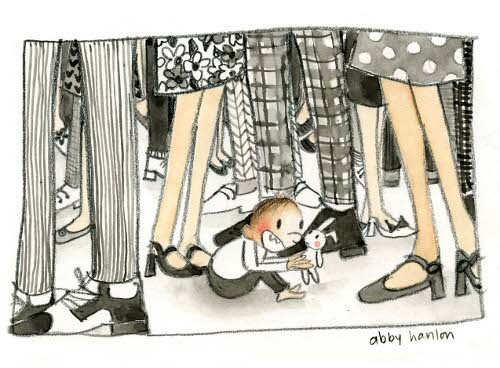 Abby Hanlon’s stuff is great! I don’t mean it condescendingly or patronizingly at ALL, but she’s got a great kid’s-eye perspective on what’s important, how to say it, and how to SHOW it. 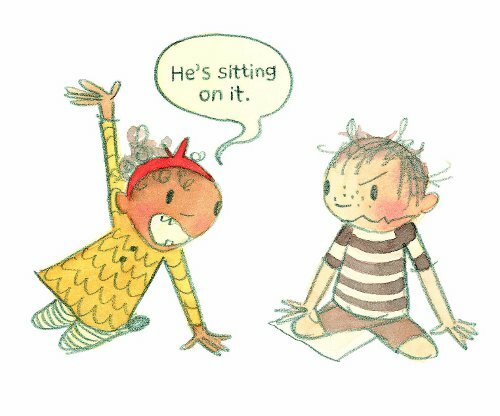 (Classic “all of the above”-type moment: the one towards the end, of the little girl calling out Ralph’s bluff: “He’s sitting on it!” and the murderous look on his face. Ha!) So hard not to imagine her second career will be a huge success, y’know? Loved that Adam Gidwitz essay, Jules. emmaco: OF COURSE you would have an alternate word, “chooks,” for “chickens.” Glad they’re safe. OTOH I think I’d pay handsomely to hear “Seinfeld’s” Elaine say something like, The dingo ate your chooks! Rachel: Thanks for the mini-review of The Descendants. Also the heads-up about Bookshelves of Doom (even if that title makes me envious), and their Noir songs post. LW: Your life, as revealed via your kicks, so often reminds me (in a good way!) of the way my niece used to tell improvised stories during long car trips when she was little. “Frankenstein was walking through the woods AND THEN Dracula came out from behind a tree AND THEN Prince Charming rode up on a horse AND THEN…” Listening to her, you sometimes had to consciously remind yourself to breathe. 1. Family and friends safe in NJ and Maryland, albeit without power (in some cases, STILL). Almost as harrowing as the stories about the storm itself, and the gasoline difficulties, were the ones about finding a hot shower. 2. We’re flying to NJ this week for the above-mentioned niece’s wedding; we’ll stay for several days and nights. Which will be fabulously kick-worthy no matter where the storm recovery process is. 4. Have you seen the Mars Curiosity rover’s self-portrait? Way cool! 5. With the autumn temperature break, The Pooch and I have discovered the pleasures of walking around a nearby pond instead of up and down the block. 6. Took a day off last weekend to do nothing at all. Of course it didn’t quite work out that way, not 100%, but the mood was right. Thanks for featuring Abby Hanlon’s work; it’s mischievous. I find myself admiring all her patterns and textures: lime green viney- and rose-patterned wallpaper, b&w trouser and skirt fabrics, chair upholstery, fireplace tiles and those swimsuits (!). Jules – lots of riches here today. Thx. Enjoy your favorite coffee drink for a boost and bring your surely-wonderful manuscript down the home stretch. jama – you make me want to snorkel, shop for bargains and organize my photos. Lori – enjoy your new sketchbook and in-tune piano. I’ll check out Dan’s book. jone – Nice to support Portland authors. Liked your fb share of Homecoming girl. My nephew has DS and was his high school’s Homecoming King; heartwarming. Tarie – your student pearls clearly think you are a pearl too. Amy – I smiled imagining the scene of your in-house librarians. Stacey – I finally got a flight out of Newark after being stranded for 4 days. I really get your gratitude: inconveniences vs. losses AND the keen appreciation of a place w/electricity or source of gas. Take care. LW – I can so picture you as Red RH! RE: My kicks this week. Rode out the storm in hotel with 5 other writers and an editor stranded post-workshop in Morristown, NJ after all flights out of Newark were cancelled. Inland, so we came through okay: hotel lost big trees, window shutters and, of course, electricity. After 12 hrs emergency lighting abd fire alarm batteries went dead, halls and stairways were plunged into darkness and we were asked to evacuate. ??? To where? So began a hop-scotching tour of NJ, looking for “room(s) at the inn” with or w/o power. Sobering, navigating our rental car (ever lower in gas) around dozens of detours for downed lines, fallen trees, floods, mile-long gas lines. My heart goes out to those still trapped in darkness or disarray. 1. stories and laughs by candlelight. 4. finding open, powered restaurant with delicious Indian food; vindaloo, masala. 5. This photo (and many like it): stoop sharing powerstrips for passersby’s cells. 6. simply being lucky; unhurt and with means. 7. bonding with the “namelos 7”. PLEASE VOTE. Nothing is sure. And… to those in affected areas, all good thoughts. Abby’s work is fantastic! Congratulations on the book. Here’s to many more. P.S. I do the same at the library. Jules- I read that fairy tale essay and was in total agreement. Good luck on the homestretch revisions. emmaco- marmalade scroll? Is that like a jelly roll? Lori- New art supplies are the best! Margie- Your posts are so cozy I just want to curl up with a cup of tea and a book. Jone- I love the idea of thirty days of thanks. Amy- I’m jealous of your vacation. Our family seems to find ours in pits and pieces. Stacy and Denise- I’m glad you are OK and are able to find graciousness in a terrible situation. L.W.- Break a leg, Little Red! JES- Have fun at the wedding but be sure to vote first! 1. Cape Cod only suffered high winds and power outages. 2. My friends and family in New York have only suffered inconvience. I am so grateful that they are all OK and know their toughness will get them through the recovery. 4. Post Sandy skies have been beautiful, day and night. 5. My beautiful girl turned 11. 7.Listening to eight 11 year olds sing along to the pop music station in harmony made me smile. JES – I like that blog analysis; it applies to picture books as well. Figuring out how to get to the heart of a matter w/o hitting the viewer over the head with the message–which is unnecessary if you manage the first. I love reading kicks! But I’ll be back either late tonight or even tomorrow to respond, ’cause I have a certain manuscript in hand that is 99% ready that I printed and want to curl up and read like the book that it is — and see if it makes any flippin’ sense (as something that I’m no longer reading on the screen, that is)! EXCITING. More soon from me …. p.s. I finally had Steve Light’s Tea Party image scanned, and I’m gonna put it up above in the post where it belongs — the proper version. Great post. 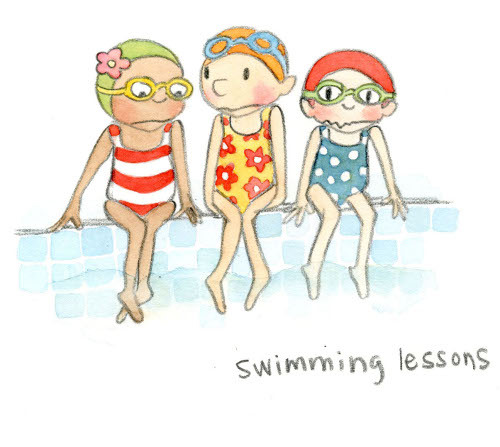 Love the fantastic illustrations by Abby Hanlon! I love, Love, LOVE Abby’s work. I’m going to show the book to teachers at my Little’s school. And I agree – the end papers are priceless. There are so many things Abby said that really resonate with me. I love her perspectives. Next can I say – SO glad everyone is safe after SS Sandy! I read some really harrowing experiences in the Kicks tonight (being up late in Los Angeles in PST). Jules – I can’t believe I didn’t know about the Gunderson family. I spent 1/2 hour on Youtube going through tracks.Fabulous and soul stirring music. Great to read everyone’s kicks. And I’ll just say it now – of course I’m going to vote! What a privilege it is to be able to vote at all, to say nothing of freely without fear or danger, and with relatively strong confidence that my ballot won’t be tampered with. I grew up in a country where these things could not be assumed nor were they a given. I’ve not forgotten that. 1. My family and friends in NYC, NJ and PA seem to be OK too. My brother and family weathered Sandy in Brooklyn and didn’t loose power or get flooded. 2. buying beautiful full-sun flowers, bushes and trees for my parents’s new patio which I’m redoing for them before they arrive Nov. 30th (moving from Oregon to be closer to us – yippee!). 3. building a pillow fort with my LIttle today and reading books in it. 4. Trick or Treating with my Little and then watching him discover all sorts of candy bars. Downside – I ate way too much of it, and so did he. 5. my week to spend a morning in my area children’s bookstore to read new titles. 6. rejoined the choir I’ve sung in for years. What a joy to sing like that again and so many wonderful people. PS: good luck with final edits, Jules! JES it seems so strange that a dingo ate my baby crossed continents. I’m here. Finally! THE MS GOT TURNED IN. YES! Emmaco, glad you saved those chooks. (That was really fun to say. I’ve only ever heard “chooks” in Mother Goose rhymes. Is that word used often in Australia, though?) And oh my gosh, have fun snorkelling! Lori: I was not bold enough to try to steal Jon’s hat. Maybe next time. … Can’t wait to read Kel Gilligan, and what are you drawing in the new sketchbook? I also got some Honey Crisps yesterday. Mmm. Margie: You handed out books? Neat. What new books arrived at your house? Inquiring minds wanna know. Jone, whew. Glad your NJ family are okay. I have lots of relatives up that way, too, but most in Pennsylvania. Tarie: I also laughed outloud at that nobody-suspects from Abby. … And I’ll say it once again: LUCKY STUDENTS OF YOURS! Amy, enjoy the faux libraries. I hope you get extended check-out times! Enjoy your Cybils-reading. Stacey, thank goodness you all are okay. I was worried. I’m sure it’s difficult to see the damage and destruction around you. I hope that your friends and loved ones were all left unscathed. … As always, I look forward to your post. Rachel, thank you for reminding me about Colleen’s post, which I just went to read. Normally, I would have read by now, but you know, the manuscript was wagging its finger in my face, understandably. … Oh, and here is Little Willow’s contribution! … Your week sounds so good. Good sleep, good movie, SUSHI (mmm), walks with Cole … Glad your friends are safe, and thanks for the hat tip about Leila’s post. Gotta go read that one. Little Willow, kick #6 is so stinkin’ COOL! How did auditions go? John, what you call the “murderous look” on Ralph’s face cracks me up, too. And I’m so glad you like the Gidwitz essay. I figured you would. Also, I bet your offline debates—all of them—are utterly fascinating. … And, yes, my IM custom quote thingy (to be precise) for a while there said, “Jules vs. manuscript — Jules just might win!” or something similar. It feels good to have sent it off. I finally feel like it’s good/maybe even ready, and I hope our esteemed editor agrees. … So glad your family and friends are safe, too. I’d completely forgotten you had family up there. Illustrator Steve Light (who made that new Mad Tea Party image) has a similar story about seeking out a hot shower. … Ooh! The Hobbit! John, I HAVEN’T READ IT EITHER! My husband wants to read it aloud to the girls before the film adaptation, and I wanna listen. Guess we better get on that. Are you enjoying it? …. Have fun at the wedding! Denise: Thank goodness you all are okay. I was worried, since you mentioned last week (right?) that you were in NJ for a workshop. “Simply being lucky; unhurt and with means” pretty much says it all, Denise. …. Glad you (and so many others) like Abby’s work. Just now, I re-posted four images, I think it was, ’cause the colors were slightly off. It’s all ready now! …. HA to that commercial. Hadn’t seen that. Moira: Singing in harmony = THE BEST (and hard, if you’re me, though my mother can do it at the drop of a pin — any kind of harmony and oh it’s just disgusting and beautiful). I saw your rainbow cake on Facebook and was super impressed. Happy birthday to your daughter! Glad your friends and family and you all are safe, too. Allison: RIGHT?! (re the Gundersen family). Such gorgeous stuff. That is how I first got turned on to Noah’s music — watching those videos of him singing with his family. … It will be so soon that your parents arrive. Exciting … Glad your family is safe, too. I love kick #5. I want to open a children’s bookstore and walk around recommending books and serving coffee to the grown-ups and cupcakes to the children. Kick #7 is nice, too. And thanks to everyone for the manuscript well-wishes. So eager to hear back from our editor!